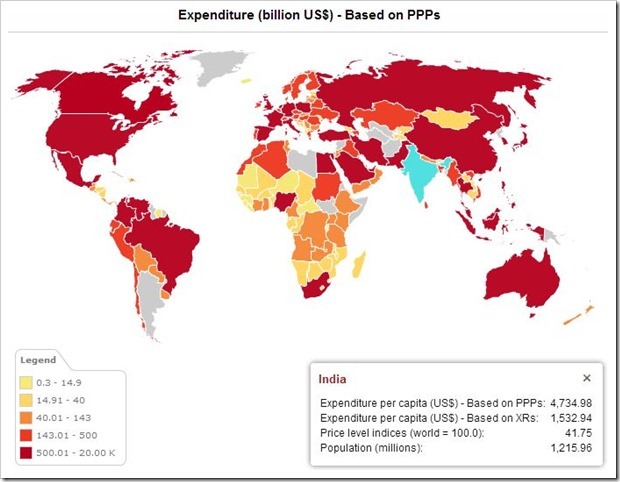 In terms of PPP or Purchasing Power Parity, India has displaced Japan to become world’s third largest economy. This was mentioned in a World Bank Report earlier this week. World Bank conducts a research known as International Comparison Program (ICP), which ranks economies of different countries based on PPP. The last research was conducted in the year 2005, wherein India was ranked #10. The next round of this research was concluded in 2011, in which India has been ranked only behind USA and China. This survey covered 199 economies of the world, and India’s share in World GDP in terms of PPP was 6.4%, meanwhile for China it was 14.9% and for USA it was 17.1%. PPP is calculated by comparing economies and income levels of people by adjusting for differences in prices in different countries. As per the report, “The United States remained the world’s largest economy, but it was closely followed by China when measured using PPPs. India was now the world’s third largest economy, moving ahead of Japan,”. This is indeed an achievement for India as within 6 years, India climbed this ranking for #10 to #3, thereby jumping 6 places, which is huge for any country. The report noted that the economies of UK and Japan actually contracted compared to US and China. Besides India, Germany also improved its position meanwhile France and Italy’s position remained the same. As per the report, the relative ranking of the three most important Asian economies: India, China and Indonesia compared with USA increased two times, whereas the same relative ranking of Mexico, Brazil and Russia increased by three times. In the year 2011, the world produced goods and services worth $90 trillion, out of which almost half was produced in low and middle income countries. The six largest middle income countries in the world are India, China, Russia, Brazil, Indonesia and Mexico and they collectively accounted for 32.3% of world’s GDP. On the other hand, the world’s 6 largest high-income economies are USA, Japan, Italy, Germany, France and UK and collectively they accounted for 32.9% of world’s GDP. – China and India make up two third of Asia’s economy, if we exclude Japan and South Korea, which was part of OECD comparison. – India and China account for 80% of investment expenditure in the Asia and the Pacific region. – The five countries with maximum GDP per capita are Qatar, Macao, Luxembourg, Kuwait and Brunei. – The highest actual individual consumption per capita are Bermuda, US, Cayman Islands, Hong Kong and Luxembourg. "India Overtakes Japan To Become Third Largest Economy: World Bank", 5 out of 5 based on 1 ratings.